If I’m being completely honest here, I have to admit I haven’t eaten chili mac in years. Years. 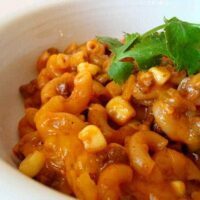 And if I’m being even more honest, I’ll admit that the memories of chili mac remind me of really bad Hamburger Helper, which subsequently causes me to break out in an itchy rash. So what prompted me to make this version of chili mac, I’m not sure. Probably the fact that I have a thing for skillet meals (i.e. Sausage and Spinach Penne, Skillet Lasagna, Chicken and Rice with Coconut Milk and Pistachios, Skillet Macaroni and Cheese, Skillet Chicken with Broccoli and Parmesan, Ham and Pasta Skillet Dinner) and I needed a fast, ingredients-on-hand dinner last week. Am I ever glad I gave chili mac another chance. My love has been rekindled in a big way. This meal could easily be classified as one of my top 10 ground beef meals. Fantastic. The flavors are delicious – mildly sweet with just a hint of warmth and spice (not spicy enough for my kids to be bothered – they ate it up like crazy). And what’s not to love about noodles simmered in a sweet and spicy tomato broth and smothered in cheese? Chili mac has to be pretty incredible for me to want to make it again. Not only could I not wait to eat the leftovers from this meal but I already have planned to make this again next week. Less than 30 minutes from start to finish and delicious to boot, chili mac is back! Heat oil in a 12-inch non-stick skillet over medium heat. Add the ground beef, onion, chili powder, coriander, cumin and 1/2 teaspoon salt. Cook the ground beef until it is no longer pink. Drain off any excess fat or grease (the amount will depend on how lean your beef is). Stir in garlic and brown sugar and cook until fragrant, about 30 seconds. Stir in tomato sauce, water, and macaroni. Cover and cook, stirring often and keeping the heat at a steady simmer, until the macaroni is tender, about 12-15 minutes. Stir in 1 cup of the cheese, frozen corn, green chiles and cilantro and sprinkle remaining 1 cup of cheese over the top. Cover and let sit off the heat until the cheese melts, about 2 minutes. 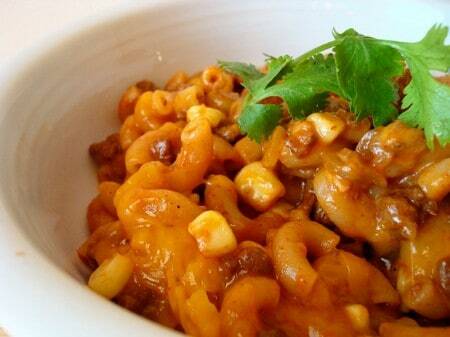 If you want a traditional chili mac, omit the corn, chiles and cilantro. Bless you for cooking in the middle of that kitchen remodel, Kesa! Simple, easy, delicious! My husband and I crave this dish. Is it too much to make it once a week? At least now we’re down to twice a month. Love this recipe! It is probably my #1 go-to for a quick dinner that everyone in my family eats without whining (rare). The other day I got everything ready to make it and then discovered the gas on the stove wasn’t working, so I threw up a Hail Mary and made it in the Instant Pot. I think it was the best batch I’ve ever made, go figure! Thank you for all the awesome recipes! I was searching your site for something new to do with the ground turkey I had and decided on this. Hallelujah, it was a dish that the whole family liked, which rarely happens with a picky 9 year old and 13 year old who have completely opposite tastes. My husband said, “This is really good, it’s like Hamburger Helper, but better!” I told him thank god, because hamburger helper? Ew! Tirns out it was his go-to meal in college and this dish brought back memories. Good think I didn’t know him in college. Thanks again for another great recipe… they rarely disappoint! This is my new favorite one-pot, easy summer dinner! My family is rarely all home at the same time for dinner, so this is perfect. It’s good right when it’s done & maybe even better for leftovers the next day! I commented once in 2013 and I’m back here at the end of 2015 to say that this is still a favorite in my household! It’s on the menu at least once a month! Made this for the second time yesterday. I doubled the recipe and packed lunches for my husband for a few days and was able to freeze some meals. Delicious! Thanks so much Mel! Well….made this once again, and it was scrumptious. Love this and anyone who is thinking of maybe trying this, don’t think about it. Just do it. I promise you won’t be disappointed. Hey Mel! I’m just letting you know there’s a typo in this recipe. It says to boil for 12-12 min. I assume (and have for years) that it means 12-15 min, but just wanted to point it out. This recipe is a family favorite, and I can’t wait for dinner to be ready! Amy – Thanks for the heads up. I fixed it! I made this tonight, and I bet you’re wondering why I am cooking on Mother’s Day. And my answer would be, I dunno. But I chose this recipe because of it’s simplicity. And I was celebrated even more after serving this dish. My husband LOVES ortegas and my daughter loves anything with a noodle in it. Bottom line, all three of us were happy. Perfect with a salad, and made enough for a couple leftover servings. Which I am looking forward to. I am certain this is even better the next day. And Mel, Happy Mother’s Day!! Happy Mother’s Day to you, too, Shellice! do you cook the macaroni before or add it into the pan precooked? Kelsey – Uncooked macaroni. Enjoy! This turned out great! Easy, quick, kids loved it. I love your blog! I have been making this since I found it on your website over a year ago. I make it all the time! It’s so wonderful and filling. I love making it when we have company because it feeds a crowd! I made this tonight for my big family using 3 cups ground beef, 1 large onion and doubling everything else, and it made enough to feed us, plus enough leftovers for my husband to take to work for lunch tomorrow. Everyone gave this rave reviews! Oh and I discovered too late that I was completely out of chili powder, so I subbed 2 TBSP. of my homemade taco seasoning mix and it still worked out. I can’t wait to make it next time with the chili powder and coriander, this was SO GOOD! Thank you Mel, your site is such a blessing and a life saver! I use so many of your recipes in my weekly menu planning, it’s wonderful. Thank you again! Made this tonight and it was so yummy! I used to be a Hamburger Helper fan… I avoid it now, but I’m always looking for similar recipes. I think the non-overcooked pasta and the corn put this recipe over the top for me. Also, my one-year-old who has barely eaten any dinner in two weeks shoveled this down! Thanks so much! My boyfriend and I had this for dinner last night and it was yummy. The flavors were awesome and the chiles added a really nice touch. It was very heavy, though, so if you’re looking for a light dish, this is for sure not it! I can’t believe I haven’t commented on this recipe before! I made it for about the tenth time tonight and it was delicious as always. I love this recipe, and always end up eating way too much. It keeps well for delicious leftovers the next few days as well 🙂 Can’t wait to have this for lunch tomorrow! Awesome! Again, my husband said, “This is really good!” 2-3 times! I’m so excited I found your site, as I will have dinner ideas for AT LEAST a year! This cooked up quickly. It’s truly a 30 minute, (or less,) meal! I used a stainless steel pan since I don’t have non-stick pans and it didn’t stick at all. You just have to watch it closely to make sure the pan doesn’t dry out towards the end of cooking. MEL!! I finally tried this…why oh why did I wait so long? Kiddos loved it~ YEA!! Thanks for all your great recipes. Luv your site! Monica – it sounds like the noodles may have been overcooked. Try reducing the cooking time a bit…maybe that will help. hi! this was delicious but was wondering how you keep it from clumping together once it gets off the heat? 5 minutes after I took it off it was all a big glob. Thanks! I made this last night and it was a HUGE hit with my 2.5 year old son. Definitely going into my rotation for easy quick meals. It’s such a great pantry/freezer meal. I served it with mash sweet potatoes. I made this tonight and it was super good! We pigged out on it! I added a can of chopped tomatoes, too…and doubled up on the spices…I like bold flavors. Fun for Cinco de Mayo, too. Thanks for a nice recipe! Michelle – if you have a weight measure, weigh out 8 ounces. If not, use about 2 cups. It should be about the same amount. This looks great! The pasta ingredients are confusing though, is it 8 ounces or 2 cups? This was so delicious! I added 1 can of Rotel tomatoes (drained), and didn’t top with 1 cup cheese (just mixed one cup with the pasta, as the recipe describes). It was a big hit and great the next day! I love this recipe, so much that I did a little “healthy” re-make of it and will be posting it on my blog (www.mimisfitfoods.com) tomorrow with nutritional information. I love your blog and want to thank you for all of your yummy, family friendly recipes! After seeing this recipe last week, I couldn’t wait to make it. And let me tell you, I’m glad I didn’t wait long. This was just as easy and delicious as you said it would be! The only change I made was sprinkling the cilantro over the top at the end, rather than stirring it in with the corn and chiles. I will definitely be making this again. Thanks Mel! Katie – I’m so glad you loved this one! Thanks for checking in to let me know. I recently found your website and have had fun browsing thru the recipes. After the holidays this simple meal sounded so good. I doubled the cilantro since we like it a lot. I think I will use slightly less beef and add a can of kidney beans next time around. I know this will be amazing for my lunch tomorrow after the flavors have blended overnight in the fridge. Jennifer – thanks for checking in on this recipe! Thanks, Erin! This is on my menu for next week, too! Another winner Mel. I added a can of diced tomatoes instead of the sauce. It was good but I think I’ll try the sauce next time. Or add a pureed veggie like someone suggested. I also liked the idea of adding beans. Both my hubby and my little picky eater gobbled this down tonight. Love your blog. I’m always looking here when I’m trying to figure out what’s for dinner. Thanks for helping the rest of us to be heros in the kitchen! Jamie – glad you liked this one and thanks for including your variations! Fantastic! Just made this and I am having a bowl right now and it is only 10 in the morning. I was out of corn but added a chopped red bell pepper with the onion. Thank you for sharing! I love Cook’s Illustrated, they never fail me. Heather – glad this was good enough for a mid-morning snack! I have made this at least 5 times since printing it out. My mom used to make something similar but with velveeta and condensed tomato soup. (bleh) I always tell people that the best thing about your blog is all the food is real! No cream of disgusting soup in anything! I am so happy to have a better recipe with better for my family ingredients! Thank you so much! So good and sooo cheesy! Katie – thanks for all the recent comments on recipes. I’m so glad you like this down-home meal without any of the processed junk! Thanks for letting me know. Tried this tonight and my family loved it but i have to double it not enough for my big eaters LOL. Thanks for the recipe. Rhonda – thanks for checking in with your review on this recipe! Glad it was a hit with those big-eaters! Felicia – your comment made me laugh – you are so right, this dish isn't particularly photogenic but it is delicious and I think your suggestion of zucchini would be fantastic! We loved this dish! Not much to look at, but so, so tasty! Next time I'll add some chopped zucchini, as well. This is a good kind of dish for stirring in some pureed squash or other pureed veg to secretly give your family more nutrition. Hey Kathy – thanks for letting me know that you and your husband enjoyed this!! I made this last night for my husband and I. Delish! I am always looking for new recipes and this is a keeper. I am sure glad I found your blog. Made this for my family and we enjoyed it, thank you, I also blogged about it today! OOOOoooo looks good !!!! I posted a fabby salad you have to try !!!!!!!!!!! This sounds right up my alley. I see me making this sometime soon. Ohhh sounds good and I needed a recipe this week using stuff I have on hand. I have everything but the cilantro and my hubby hates it so that’s ok. Can’t wait to try it! I just found your blog a couple weeks ago and I love it! You cook just like I do (as natural as possible, but not overly complicated.) I’m really enjoying looking through the archives and making plans to try dozens of these recipes. Thank you! I have a recipe very similar to this where you add a can of kidney beans. That might help you on your quest to get the kids to eat more beans. What an excellent idea!! I would’ve never thought of making chili with macaroni in it. It looks yummy! I’ll have to try it one night. i’m not a huge fan of hamburger helper either, but this looks dang good! I made this for dinner last night & we loved it! This looks fabulous for a weeknight dinner – I am totally making this soon! I made this for dinner last night and it was fabulous! After a few big bites my husband look up and said “Babe, this is sooo good!”. Then after a few more he said “This is definately a winner.” And I love the fact that I can have everything in the pantry and/or freezer for a no brainer dinner! Thanks for sharing! Sarah @ Pumpkin Patch – oh, I’m sorry you’ve been sick. Hope everyone is on the up and up. I wish I lived next door to you and I’d whip you up a batch of rolls to help you feel better! Annemarie – glad you liked it. Thanks for letting me know! jjnhubbs – I’m glad you are loving the no-fuss meal that this is, just like I did. Your husband’s comments cracked me up because he sounds exactly like mine! Julie – thanks for stopping by. I hope you find some recipes worth trying. I always like to hear from people who have similar food tastes – I try to avoid processed foods as much as I can and make our meals kid-friendly (and fast!). Made it tonight for dinner~it’s a keeper! My family loved it. Put a little sour cream on top…it was yummy! Thanks! Shelley – ok, the sour cream on top idea is a total “duh” moment for me. Why didn’t I think of that?? Sounds delish. I’m glad you liked this! I’m here to give you a WOOT WOOT! Made this for dinner tonight and HOLLA! It was delicious, delicious! The corn was such a nice surprise, added just the right touch. Didn’t have cilantro, but it was still perfection. Thanks so much for all your recipes, I love your site, your humor and all you share with us. Hey Allyson – thanks for the comment! I’m glad you liked this, thanks for letting me know. I could just see your enthusiasm in your comment – it made me smile. Those enthusiastic Shumway girls….heavens! This sounds like such a great way to dress up mac n cheese! I made this the other night, using chicken instead of beef. De-lish!! I did add too much cilantro, very strong stuff! My kids requested the cilantro be on the side next time 🙂 Thanks!! Jillian – glad you liked this (sorry about the strong cilantro!). Thanks for letting me know.